The National presents the work of three emerging artists, Kvetoslava Flora Sekanova, Sarah Walker-Holt and Gillian Deery whose practices push the physical possibilities and conventional notions of the materials they work with. Through their own distinctive exploratory practices these artists manipulate, rework and transform their materials, which are still imbued with their previous histories, to form new works which challenge these original associations. The word “Respect”, communicates the interaction between the artist and material during and throughout her practice. The intrinsic qualities of the materials, which include their previous contexts, are both respectfully considered and a source of inspiration in the development of her work. Flora’s work involves the modification of newspapers. ‘I am intrigued by its formal qualities and illusionary effect of variegated and patterned surfaces. I laminate the recycled newspaper multiple times, then carve it, layer it, hollow it out, reconstruct it, and manipulate its surface.’ She is interested in the way in which these old newspapers evoke subjective responses by individuals, especially considering such responses are often shaped by their cultural and personal experiences and memories. The word ‘prolong’ seems to permeate every facet of the Sarah’s practice. Her work consists of mechanisms which allow the piece to physically pivot and lengthen. 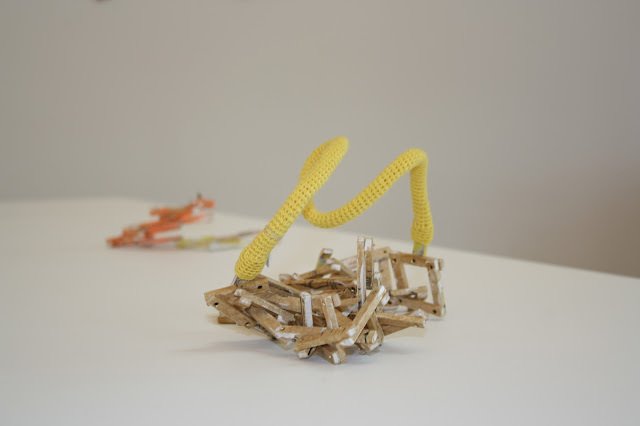 Sarah’s practice involves the recontextualisation of found objects beyond their original function and purpose through the alteration of their forms. 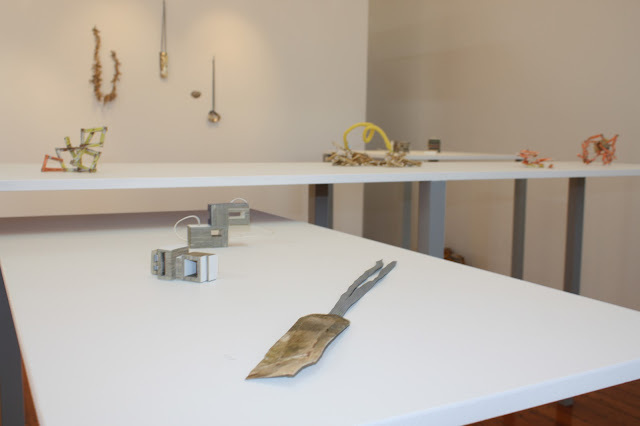 Sarah has used items of domesticity, such as kitchen utensils, which she then deconstructs to ‘prolong’ their purpose, while also creating a new ornamental purpose for the object to enact, which rejects its initial utilitarian function, while still acknowledging its relationship with the human body, ironically as an extension of the body. Sarah’s works acknowledges the role of the wearer, intrigued by the interaction between piece and body /wearer, extending her process onto the wearer, the piece enables wearer to take on the role of maker to reconfigure formations, engaging in a collaborative dialogue with the artist. Further extending the potential/possibilites of the work. 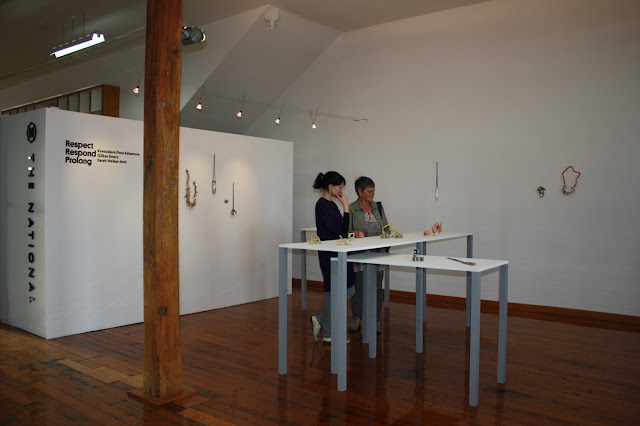 “I work to construct objects out of sterling silver sheet and found objects, without using solder. Material play and pre-meditated action work in tandem to facilitate the transformation of two-dimensional sheet into a 3-dimensional form. The word ‘respond’ suggests the correlation between artist and material, a reciprocal process where play, chance, and the inherent qualities of the medium informs the artist’s process. The physical manifestation of the work implies a collaborative process between artist and her chosen materials. Gillian constructs her objects employing the use of an alternative approach to formulate and fuse various elements together. Utilising the historical associations of sterling silver metal specifically as a material which signifies wealth in traditional jewellery construction and adornment, Gillian addresses the traditional and historical notions of her materials, forming new objects which reference the initial associations within a reorganisation of its structures.